Not long into her newfound sobriety, Lillie West was hit with a series of intense experiences — a home invasion and the loss of loved ones, the kind of events that can change your whole way of living, thinking, and seeing the world. Dread grew as she feared for her safety, and for the safety of everyone she cares about: "If these unexpected scenarios are happening everywhere, why wouldn't they continue? I just felt like nowhere is safe, for a while," she says. But a deadline to record her sophomore record as Lala Lala, marking her first for Sub Pop offshoot label Hardly Art, loomed. And while limits like that can sometimes clog creativity, in examining her paranoia, isolation, and sadness, each song fed the next, West says: "They just fell out." Today, The Lamb, the result of West's introspection, is officially released: 12 tracks rooted in post-punk and wrapped in a pop gauze, like a coping mechanism to bring some positivity into all the turmoil they actually carry. Good can come of introspection, after all. 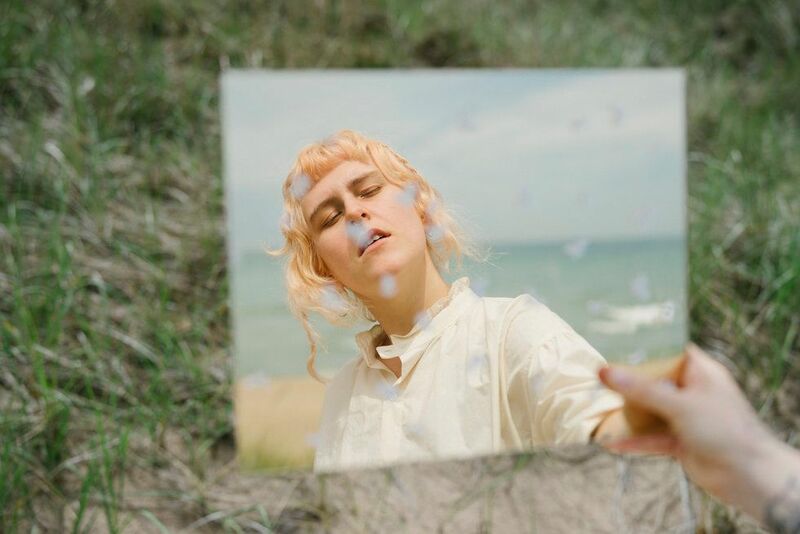 We can make real progress by confronting difficult memories — and in doing that for herself, the Chicago-based songwriter offers listeners a tool for their own emotional reckoning. PAPER premieres the video for "Scary Movie," through which West reflects on her own memories through those of her parents, who in the clip are shown kite-flying beachside before she was born. We spoke with West to find out more about the footage and the choice to pair it with the track, and we learned more about the process of writing The Lamb, too. I realize you probably haven't memorized your label bio, but Hardly Art included this one line that really stuck with me: that with The Lamb, you were "hoping to capture honest snapshots" of your "past selves." Can you elaborate on that a bit? I mean, I have and I always have had a lot of guilt and shame, especially comparing times when I was not sober, and now I have been sober for two years. This album is the first thing I have written as a sober person and it's very much about how do I not let these terrible things that have happened to me or that I have done myself, like, overcome me? How do I recognize them and grow from them — instead of collapsing, I guess. There's always the temptation to intentionally forget certain memories, to try eliminating them. Totally. I wish I could do that a little more; I could probably use that. Have you felt supported in the Chicago scene as a sober person? Totally. I did have to change my lifestyle quite a bit. I do go out a lot less, but the Chicago music scene is so supportive. I'm just excited for people to make stuff, and there's a fair amount of sober people already, or there were already. You're originally from London, then you lived in L.A. Was school what brought you to Chicago? I moved when I was 19, almost 20. I was [in school] for a year and two months, and I guess I just didn't feel committed to it. I really liked the school and I like school in general, but I felt like I was wasting everyone's time because I wasn't fully present. And then Emily [Kempf] asked me to go on tour with her band at the time, Supermagical... and then I just never went back to school. I left with them, and decided that I would rather be doing music. When I left I was into offset printmaking and sculpture installation. Do you continue any of those endeavors now? No. I do like small-scale stuff. I always try and draw and do crafts and stuff, but I don't really do sculpture. I don't have the tools or space to facilitate it. But I really like all that stuff, and I try to do art stuff a lot, because it makes me feel better. Let's get into "Scary Movie." It's such a juxtaposition, the connotations of the title against the peaceful, calm 16MM footage of your parents you used for the video. Can you tell us about more about the song, and what made you decide to pair the two? Like, every scary movie that I've ever seen, I remember. And every time I'm alone or in some dark corridor or something, I get flooded with imagery of all the scary movies I've seen. I feel like my brain cannot disconnect that it's fake. People I've watched scary movies with are like, "Why are you afraid? This isn't real." My brain won't recognize that — it feels like my brain can't separate [the two]. If I see it, it can't separate fake from real, and I feel like that a lot with that footage. My dad is a filmmaker, and he has filmed pretty much every moment of my life from when I was born. As the footage shows, it's my parents before I was born — so I have all of these memories that, sometimes, I'm not sure if I actually remember or if I've just watched them. And that song is a lot about the blurred line between real memory and fake memories, and it just felt appropriate to pair them. And it's sort of a tribute to my parents, because I love them so much. Are they still living in L.A.? No, they moved back to England right after I graduated high school. Now it makes sense why you've paired them together. I recognize that feeling in pictures from my own childhood; I don't know if I remember them being taken or if I've just seen the photo so many times that I've created my own memory. Yeah, totally. Or maybe it was someone else, and your brain makes it into you. That's possible, too. Memory is unreliable. So how are things with you now? Do you feel like you've moved forward from what you were feeling while writing The Lamb? I am a lot better. I'm still very cautious, and I go into more paranoid periods of time based on what else is happening in my life. But yeah, things are better. I do think time helps everything. I don't know, hopefully it's all part of some kind of education — as more things happen to me, then all my decisions are in some way more informed. I don't know. I'm hopeful. When you're playing this album live and being interviewed about it, do you feel like you're rehashing everything? Does it help or hurt your progress? Sometimes it feels like talking about it for the first time, but other times, it feels like singing a cover, and it's more about the performance and the emotion of the song. I feel like that also might affect your memories, too. Oh, totally yeah. Your brain's ability to turn on and off certain things is so wild.